Blender, Boxcutters, Jigger, Citrus Juicer, Strainer, Saucers, Tablespoons, Large Martini Glass, Cup. To prepare the Martini Glasses, dip the rims in Egg White, then in fine table Salt. Set aside. 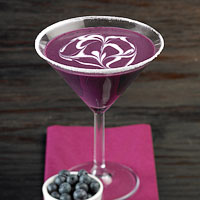 Place the Wild Blueberries in a blender with the Rum, Sugar, Soda water, half of the Coconut Cream and the Juice of two Limes. Pour into prepared Martini Glasses, then finish with a swirl of remaining Coconut Cream.